The modulator (1) and electronic control unit (2) are at the heart of Continental's second-generation electronic stability control system. Electronic stability control -- sometimes referred to as stability control -- helps a driver prevent skids and swerves that can happen in an emergency. This makes the technology especially effective in combating SUV rollover accidents. 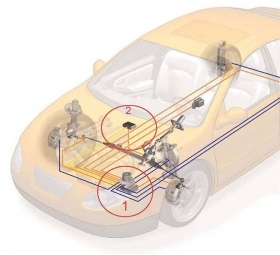 The electronic control unit at the heart of the system brakes each wheel individually and decreases engine torque to maintain a stable direction of travel. Electronic stability control continuously monitors such factors as a vehicle's speed and side-to-side movement. Installation rates for electronic stability control systems have been increasing in the United States. But the technology got a big boost in the past 10 months with announcements by the Big 3 that they were making stability control standard on many or all of their SUVs. TRW Automotive Inc. is working with supplier Goodyear Tire & Rubber Co. to develop stability control that can be linked to characteristics of the tires. Many new tires often have identity tags. Using those tags, "We can tailor the ESC software to suit different tires and wheels," says Phil Cunningham, product business director for chassis systems at TRW. "For little or no cost, we can increase the performance of the ESC." Consumer and dealer awareness of stability control remains relatively low, especially in North America. Electronic stability control systems are increasingly required to interact with a number of other systems in the vehicle -- such as steering, adaptive cruise control and tires -- increasing the risk of electronics problems. Advics Co. Ltd., Robert Bosch Corp., Continental Teves, Delphi Corp. and TRW Automotive.